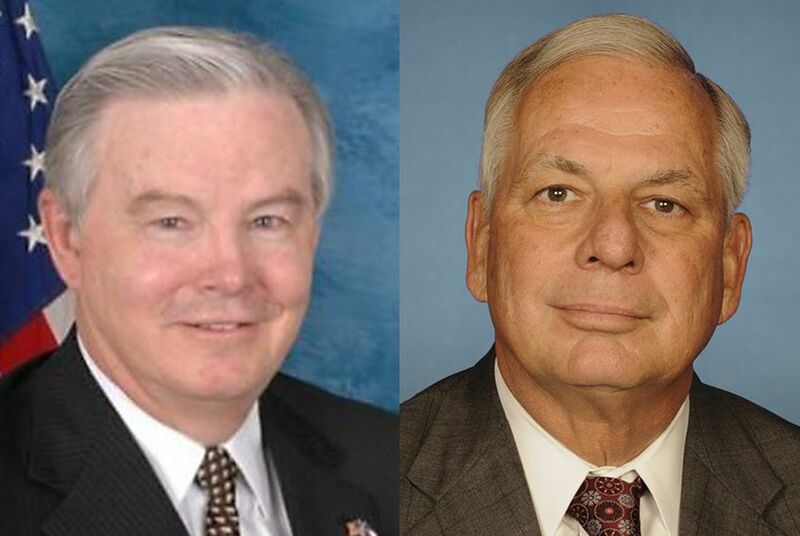 Texas Congressmen Gene Green and Joe Barton went head-to-head Thursday on a bill that would lift a 40-year-old ban on crude oil exports. U.S. Rep. Joe Barton, R-Ennis, and U.S. Rep. Gene Green, D-Houston. WASHINGTON — U.S. Reps. Gene Green and Joe Barton of Texas went head-to-head Thursday on a bill that would lift a 40-year-old ban on crude oil exports. It was imposed to alleviate energy scarcity during the OPEC oil embargo. Barton, chief sponsor of the bill, says it would create jobs, drive down gas prices and boost the American economy. Virtually all Texas state lawmakers and industry regulators agree with him, arguing that finding more buyers for U.S. crude would prompt more drilling, pouring more cash into the state treasury. Though proponents of lifting the ban have gained momentum recently, swift passage of the bill is a long shot. Some opponents of the proposal fear that a repeal could increase fuel prices for refineries and drivers, with some suggesting it could spur more drilling that harms the environment. Green, D-Houston, opposes the legislation. “This is the best time to be in the refining business in Texas that I’ve ever seen,” Green said during the hearing. Lifting the ban would undermine expensive upgrades that refineries in his East Texas district have already made in a move to process lighter grade oil, he said. Most refineries in the United States are capable of processing only heavy crude oil. Now lighter sweet crude oil is more abundant, thanks to new extraction technologies like hydraulic fracturing, or fracking. At issue for Barton and Green is whether that lighter grade oil should be processed in the United States or should get a green light to hit the global market and be refined abroad. “As a policy-maker in our country, I would much rather we have that investment in our refineries,” Green said. The Democratic House member did indicate cautious support for establishing an application process for exporting crude, but he said his district would lose out the way the Barton’s bill is currently written. The legislation’s supporters said it would provide much-needed relief for an industry that has taken a hit as the oversupply of crude has locked companies into artificially low selling prices in the United States, as opposed to what it could attract on the global market. American companies may export refined petroleum products such as gasoline or diesel, but most crude here is stuck at home. That’s due to a policy dating back to the mid-1970s, when the United States produced far less oil and the 1973 Arab oil embargo caused global oil prices to skyrocket. In 1975, President Gerald Ford signed the Energy Policy and Conservation Act, which banned crude oil exports with few exceptions — an effort to keep oil here and protect against price shocks. But now, the United States — led by Texas — has become the world’s top oil producer, largely due to technological advances like hydraulic fracturing. But that surge of production has driven down U.S. prices and slowed drilling across the country, with big implications for the Texas economy. Barton added co-sponsors after the hearing Thursday, bringing the total to 78, including nine Democrats. Sens. Lisa Murkowski, R-Alaska, and Heidi Heitkamp, D-N.D., have introduced a similar bill in the Senate. Congress is far short of a consensus on what lifting the export ban would accomplish. Take national security, for instance. Opponents of the bill say lifting the export ban would backtrack on progress toward energy independence and would leave the United States vulnerable to crises abroad, due to a continued reliance on imports. It would also require costlier military protection for sea lanes, they say. Advocates insist the move would benefit national security by giving the United States extra clout with Eastern European countries hungry for a friendly and stable oil supplier. Lifting the ban would also provide increased bargaining power with Russia, another major oil producer, proponents say. On gas prices, supporters believe the bill would bring down prices at the pump by unleashing a new supply of oil on the world market. But foes assert that this benefit is not guaranteed and might not last for long because the global market is unpredictable. “Exports may help oil companies, but will they really benefit consumers?” asked Rep. Frank Pallone, D.-N.J. Critics believe the efforts to remove the crude export ban will not succeed. The U.S. still relies on oil imports and removing the ban now would be premature, they say. “You’ve completed eight steps on a 12 step recovery program for your addiction to [foreign] oil,” said retired Navy Cmdr. Kirk Lippold, who testified in opposition to the bill. The next steps for the legislation are unclear. A spokesman for the energy and power subcommittee said the panel will decide whether to send the measure back to the full committee or make changes in the subcommittee. Texas Tribune reporter Jim Malewitz contributed to this report. The Medill News Service is a content partner of The Texas Tribune and is providing reports from Washington, D.C.